Registration for the 2017-2018 School Year is now open! You must be registered by March 3 to avoid the late charge of $100. To view tuition charges and the educational contract, login to RenWeb. Information can be found by looking under School Information, Resource Documents, and Newsletter Archives. Please send the the $200 registration fee along with your signed agreement to be sure you are registered. Open House is next Thursday night at 6:30. 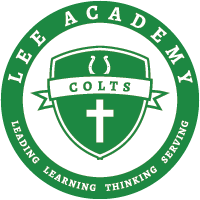 Don't forget to complete your purchases from the Lee Colt Fan Shops by February 20! Blue Jean Week is next week. For $10 you may wear blue jeans and a Lee Academy T Shirt for the week of February 20-24. You will pay your $10 to your first period teacher, and she will mark your name off. You must bring your $10 by this Friday!